First of all…I know I missed the Weekend WTF?! last week, but I am making up for it this week. I promise. Secondly… you need to be told about the epic – and I do mean epic – existence of The Kwanzaa Cake. Oh, yes. 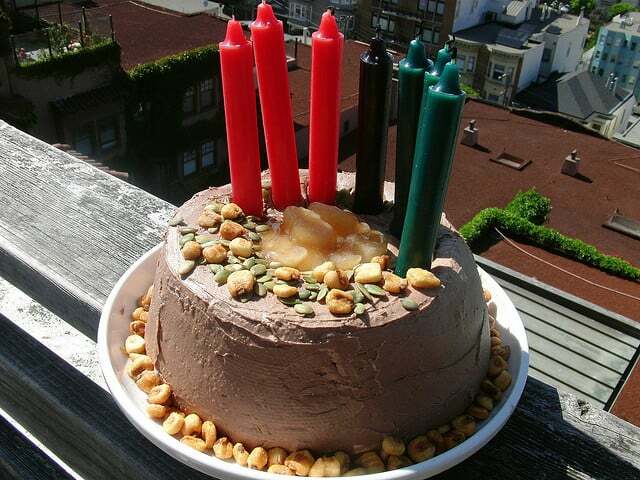 A Kwanzaa Cake. Now… after you’ve watched that, I’m sure you have diabetes. The worst recipe ever created on the Food Network was the cringe-worthy Kwanzaa cake made by Sandra Lee on her “Semi-Homemade” program. It was so bad we wondered whether it was farce; it appeared to be genuine. It gave rise to questions, though: who created it? Who could be so evil as to open Pandora’s recipe box? Certainly not Semi-Homemade Sandra herself; her talent runs more to ugly tablescapes and sticky sweet alcoholic beverages by the pitcher. First of all, if you haven’t seen the horror story that is Sandra Lee’s Kwanzaa Cake, let us refresh your memory with this YouTube video. Note that Sandra Lee does not know the difference between cocoa powder and powdered hot chocolate, and that she says she’s putting acorns on the cake, but then sprinkles on corn nuts. Put down the vodka, Sandra, then read the recipe before beginning. Then… the originator of the recipe, Denise Vivaldo, told the tale of The Making of The Kwanzaa Cake. One night in my office, at least 10 years ago, my phone rang. I answered it. If only I had noticed that my dogs started to howl and blood mysteriously started seeping from the walls. Alas, I did not. So excited to close the sale, I made an appointment with a personal assistant to meet “the next Martha Stewart, only bigger.” I was happy to think about this latest project that would help feed my assistants. It turned out that the premise of this cookbook would be “delicious desserts with nothing made from scratch.” This book would be the second in a series. The first book was almost done, but apparently the writer, food stylist and recipe tester from that first book had all gone sailing in the Bermuda Triangle to celebrate and had disappeared. The books were being self-published by Ms. Lee, unless she could find a publisher, ASAP. She really, really wanted a publishing partner. I assumed it was the ten years of smoking dope in my formative years that was making me stupid. Then I thought, okay, this is another slant on The Cake Mix Doctor, by Anne Byrn. A book that had been wildly successful. I can do this. Before you say a word, let me say one more thing in my defense. I have people that depend on me for their livelihood. Assistants, designers, photographers, and especially my American Express Platinum card. I sign the checks, so I have to bring in the money. To make my small business work, I took the job. First time I ever signed a contract. Of all the truly big stars and real celebrities I’ve worked with, it was always just a handshake and my reputation for getting the job done that created the deal. To put it simply, I deliver what I say I will. Ms. Lee insisted on a contract. Her attorney at the time also sold Mexican art. Please, I can’t make this sh-t up. F-ck me; of course I should have seen the writing on the wall. Thirteen months past and after exactly 151 recipes, I tried to fake my death. Ms. Lee called and though we were done with the book, she needed at least ten extra angel food cakes for “fun” sugary holiday times to sell to a magazine. Just a reader’s note, it wasn’t Gourmet, but the magazine I designed those “adorable cakes” for is still in business. Please ask yourself, what would you have done in my place? See how that Kwanzaa cake is looking better from my perspective? I will tell you truly, the candles were her idea. I guess I imagined something more refined. And I know the Corn Nuts were disgusting, but she didn’t. As a matter of fact, the more tasteless the recipes got the more she liked them, the faster she approved them, and I could get home and drink some medium-priced wine after our meetings. She’s not a good role model for abstinence. The last words I’ll speak, before I board my plane and go to a land where nobody knows Sandra Lee, is that I had to fill the cavity of the Chanukah cake with marshmallows so it wouldn’t collapse under all that frosting, and so that much-discussed pearl Star of David “crown” wouldn’t topple. It seemed like a good idea at the time. And to think, Anthony Bourdain was afraid of her. Crap, he was never even close. Please – please – read her entire article. It is hilarious. Oh, and by the way… if you make this cake, I can’t be your friend. Ever. Never ever ever… and I say that with love. Maybe I’m stating the obvious, but why does Sandra Lee think those who celebrate KwAnzaa need a cake? Forget being all PC and all-culture encompassing…this hot mess is fugly and unnecessary. I don’t know anyone who celebrates the holiday, but I’m sure there is some dessert-like dish in the line-up. P.s. I didn’t know that the consensus was SL was nuts. As I commented on Facebook, Sandra Lee is NOT playing with a full deck. Her programs are not really to assist people in healthy cooking and eating. They’re simply platforms to fuel her addictions to bad food, alcohol and OCD (i.e., those stupid “tablescapes” and her incessant need to match her clothes to the set designs! WTF?). The most concerning this about Sandra is those eyes….she looks so creepy. I saw her make a Lavender Martini…looked so nasty. I don’t know what’s funnier, the article, the cake or your title : “Weekend WTF?”…OMG!! ROFLMAO!! Everything about this is horrible…absolutely everything! Okay is it just me but this is the first I’ve heard of a Ms. Sandra Lee. Secondly, seriously a Kwanzaa cake? and the damn candles? OMG, I’m too through. OMG! For real! I am so glad i did not see this in person. What a mess! A KWANZAA cake, semi home made! I’m so thru! I didn’t like that show and now i have concrete reason! Huh?? A cake, not made from anything but processed products…I have nothing to say but thank you for saying something that’s a lot cleaner than what I’m thinking. Now, I have to go wash out my mind.